Paul Morigi/Getty ImagesWarren Buffett speaks onstage during Fortune’s Most Powerful Women Summit – Day 2 at the Mandarin Oriental Hotel on October 13, 2015 in Washington, DC. Berkshire Hathaway upped its investment in Apple, documents filed Wednesday show. Warren Buffett’s firm also added to its stake in two banks, while shaving its holdings of Wells Fargo. 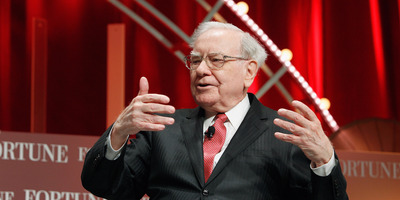 Warren Buffett’s Berkshire Hathaway has upped its bet on Apple, regulatory documents filed Wednesday. In the fourth quarter, the Nebraska-based firm upped its holdings of Apple by 23% to 31.2 million shares. It’s stake is now worth $US165.3 million, according to analysis by Bloomberg. The positions are from a public document known as a 13F, which funds must file every quarter. According to the filing, Berkshire also raised its holdings of BNY Mellon, Monsanto, and US Bank, while decreasing its investments in IBM, General Motors, Sanofi, American Airlines, and Wells Fargo. Earlier this year, the company lost as much as $US2.4 billion on paper thanks to Wells Fargo’s stock slumped, which occurred after the bank received a rare growth ban from the Federal Reserve. Earlier Wednesday, Berkshire’s vice chairman, Charlie Munger, said government regulators should ease up on the embattled bank. It’s not clear when in the quarter the company bought or sold shares of Wells Fargo – or any of the listed equities -as the filing requirements are only four times per year. Buffett is famously a fan of diet coke, and the company has not changed its holdings of Coca-Cola, maintaining its 400 million share holding worth $US18.4 billion.